/Assigned Seating /How do I create an event using a seating map? Creating an event with a seating map is an easy task. 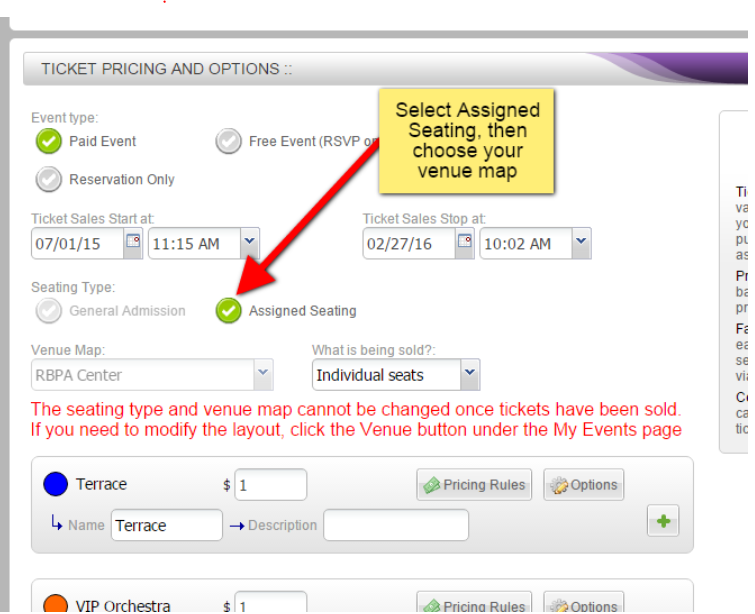 Make sure you have a seating map uploaded to your account. Contact your service rep on how to get a seating map. Once you have one on your account all you have to do is create a new event using the menu button on your account page. Fill out all the information about your event and when you get to “Ticket Pricing and Options” you will see the “Seating Type”. Here you will select “Assigned Seating” then select your map from the pull down menu. Make sure you fill out all the pricing for all the sections and you will be all set.